A little boy pretending to be Santa leads his trusting dog, outfitted as a Reindeer, on a sled to deliver presents to their loved ones as furry friends look on. A brightly shining lantern lights the scene in the nostalgic designs. 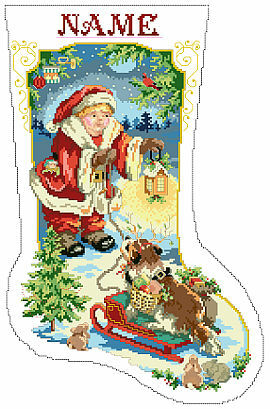 The Kooler Design Studio team of designers has been creating cross stitch designs for over 30 years.